Just as I am right in the middle of the final steps of finishing the bathroom, I figured that I should also let you in on what I’ve been cooking lately. I made this dish about a week ago and Mary Jo and I thought that it was wonderful, so I made it again, just to make sure! And I think the real reason I made it again is because it is so fast to prepare. The hardest part is peeling and deveining the shrimp. 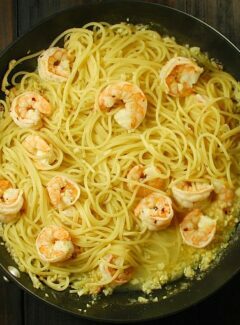 If you have shrimp that are already cleaned, then this garlic and citrus shrimp with pasta dish is almost on the table. I really like fast and easy when I’m busy with other projects. Since I’ve been busy tiling, Mary Jo has been doing the cooking and she has come up with some killer food. Like really flavorful potato soup and super good spaghetti with meat sauce. 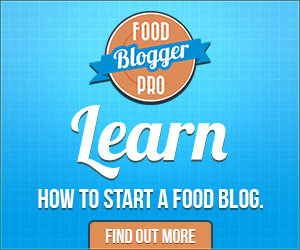 She really should be putting some of her recipes on the blog. I’ll have to get her working on that in the next few weeks. Thanks for cooking and cleaning up dear! Preparing this dish is really straightforward. 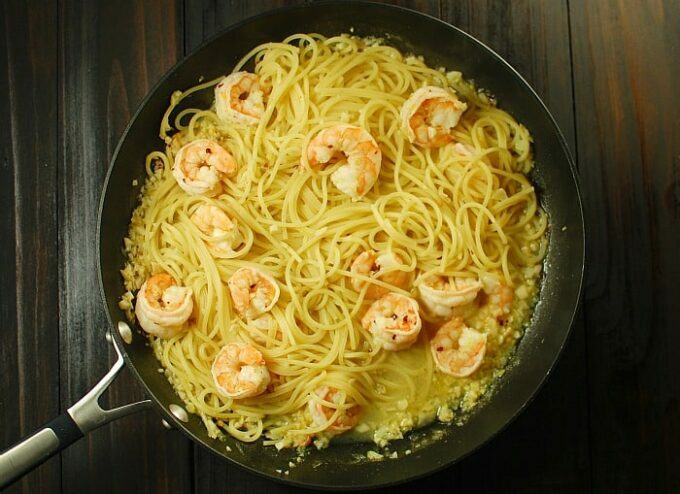 The beauty is in the simplicity, but there is so much flavor with the large amount of garlic and the combined citrus. 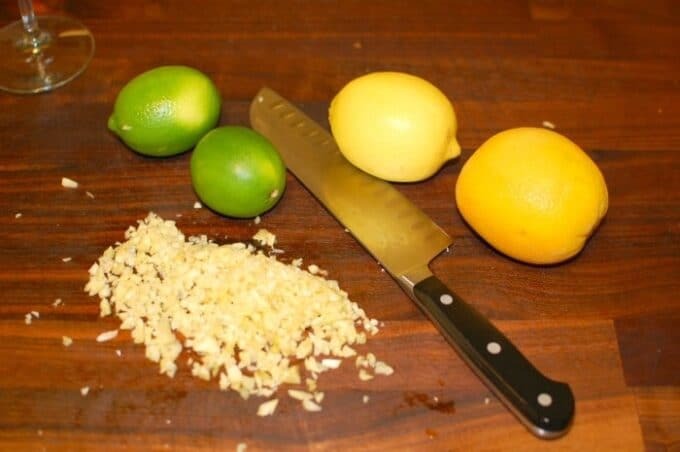 Add to this a little zest from the orange and the lemon and the flavors are further enhanced. No need to grate any cheese for this pasta dish either. 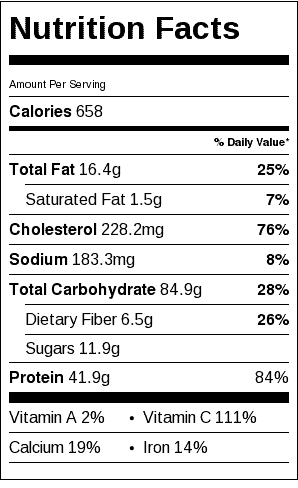 As a matter of fact, cheese would detract from the huge citrus flavor. Just serve with a salad on the side for a super satisfying meal. 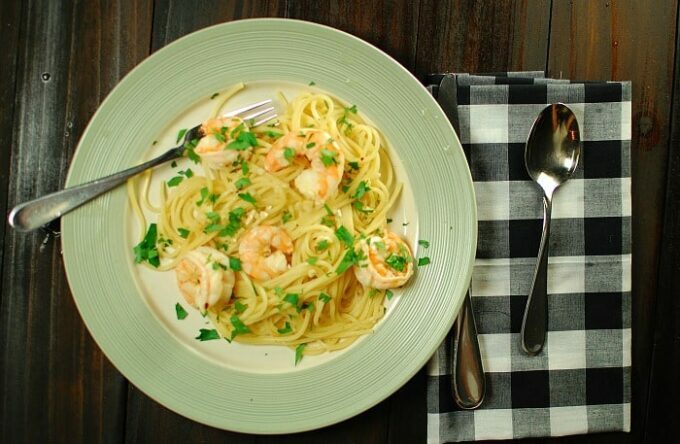 With the weather getting colder in the northern latitudes, this shrimp dish screams Florida and sunshine. 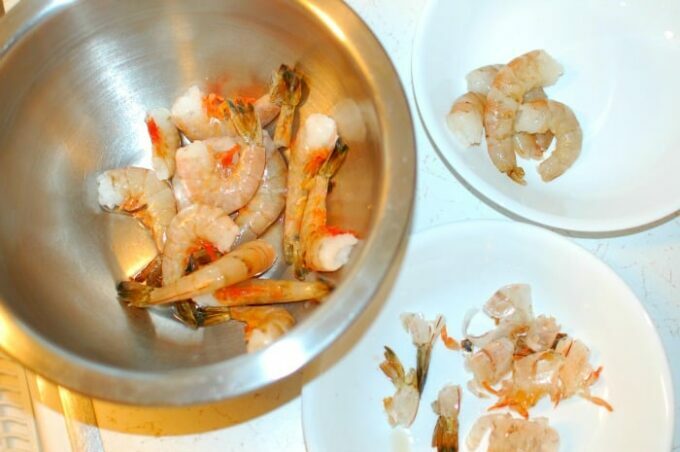 Give yourself a tropical break and try this the next time you prepare shrimp. It is delish! Cook the spaghetti in salted water until al dente and drain. Meanwhile, in a large skillet on medium heat add butter, canola oil and garlic. 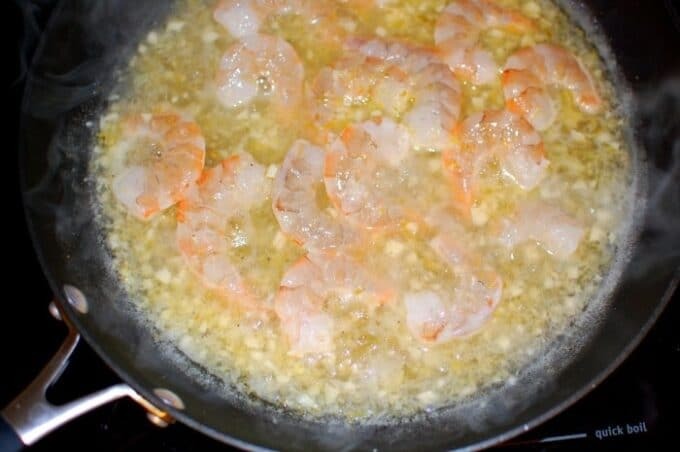 Add the shrimp and red pepper flakes, and cook on one side for 1 minute, turn and cook on second side for 1 minute and take off the heat. Immediately add the cooked pasta and stir to combine, adding salt and pepper if desired. Serve with chopped parsley as a garnish. Start the pasta boiling first, then start the garlic and citrus. 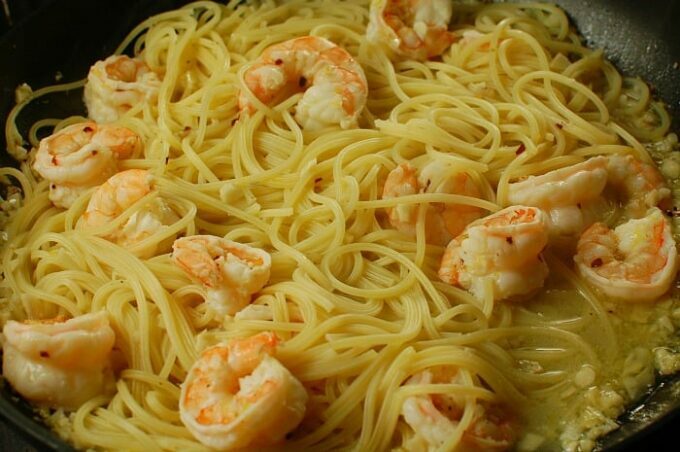 When there are 2 minutes left for the pasta to finish, add the shrimp to the skillet. The timing for finishing this should be pretty close. Easy peasy! It is dang good isn’t it!